This function provides a tool to display and organize a list of the toolpaths in the active file. Any of the actions possible on a toolpath or set of toolpaths can be accessed from this function. For in-depth coverage of each function within Machinist use the MachinistRefManual . Toolpaths can be sorted into user definable groups so that they can easily be selected and acted on in sets. Using the Create New Group button will add a new group named Unnammed Group to the bottom of the list. Toolpaths can be moved between groups by simply dragging and dropping toolpaths using the cursor (click on and hold button until over the desired new position). New toolpaths will be automatically added to the active group. Toolpath order in this list can be used to determine toolpath order in the NC program. Ordering the toolpaths here is as simple as dragging and dropping toolpaths using the cursor (click on and hold button until over the desired new position). Groups can be ordered the same way. Toolpaths and groups can be renamed using the standard Windows method of selecting the item in the list and clicking on it again. This will change the name into an edit box which allows the name to be typed over. The <Enter> key completes the editing. Toolpaths can be selected by clicking the group it is in or just the toolpath. Multiple groups and/or toolpaths can be selected by holding the <Ctrl> and <Shift> keys during selection which folllows the standard Windows list selection rules. Selected items will be highlighted and totalled at the top of the dialog. In the example shown in the image above one group is selected and highlighted. 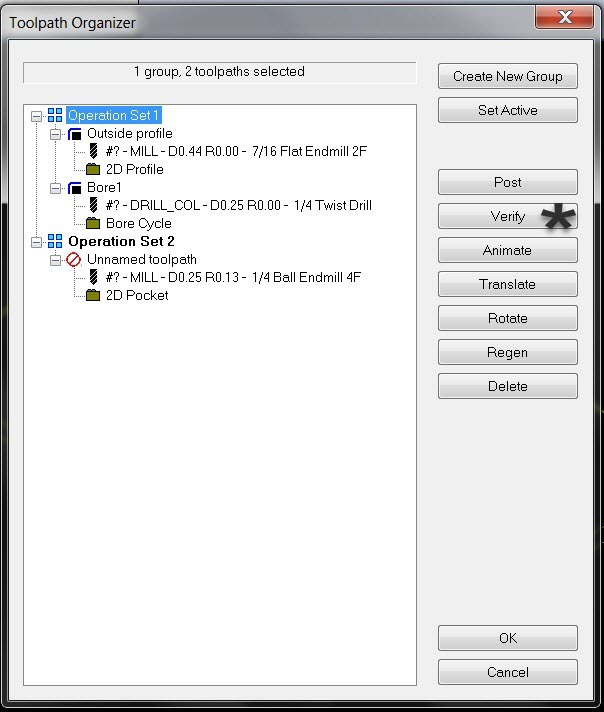 The two toolpaths in that group are also selected as noted at the top of the dialog. Toolpaths can be marked as suspended so that they can not be selected from this list. This suspension does not effect the ability of other functions to select the suspended toolpath using the graphics window. In the image above the 'Unnamed toolpath' in the 'Operation Set 2' group is suspended. Note the strikethrough icon. This is the graphical indicator in the list that a toolpath is suspended. Functions such as Post, Verify, Delete, etc. can be applied to the selected toolpaths using the list of buttons down the right side of the dialog box or by right-clicking (context selection) over one of the selected items in the list. Drilling toolpaths with multiple canned cycles list each cycle as a separate toolpath. However if one is deleted they are all deleted. Drilling toolpaths do not support regeneration.